This is part one of two dispatches from the 2014 EntouRaj for Kids charity event. Last week, Ram played host to former world No. 4 James Blake, current WTA No. 44 Alison Riske, and up-and-coming UCLA sophomore Jennifer Brady, a week-of replacement for Melanie Oudin, who is still recovering after a heart procedure and eye surgery. This edition of EntouRaj featured female players and mixed doubles for the first time, with Riske topping Brady 6-4 before pairing with Blake to beat Ram and Brady, also 6-4. Then Blake raced to a 3-0 lead in singles against hometown boy Ram, ultimately taking that charity hit by another 6-4 margin. James Blake hasn't really played tennis since this year's U.S. Open but looked sharp in edging Ram at Carmel Racquet Club. Jonathan Scott: Raj, you tweeted awhile back that it's 11 years you've been on the tour. You said time flies. Just what are the highs and lows of your decade-plus? Rajeev Ram: Mostly highs, for sure. I've definitely enjoyed my time playing. Of course, you always feel like you could have done better. The fact is, though, that I've been playing for that long, and I don't take that for granted. Playing professional tennis is pretty cool. It's better than the alternative. Ram: I don't know. I've yet to find out. It's crazy how fast it goes, just the idea that I played in college 10 years ago. It's amazing. JS: You're in the 30-plus crowd, which is nothing to scoff at theses days—Federer, Serena, and so on. What's your recipe for the rest of your career? Ram: We were talking about it in the car, just trying to stay as injury-free as possible, obviously. I think having somebody around, traveling with a physio full-time this year, having somebody around on a day-to-day basis is a huge help, and is a necessity at this point. You don't recover as fast as you used to, when you were 22. JS: What does it mean to you to when you see a Li Na or a [Nikolay] Davydenko retire from the sport? Ram: People come and go, right? 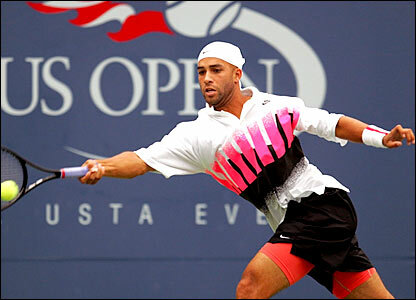 James [Blake] stopped a couple years ago. Just to see people who I've played with, played against, have seen on TV before I even started, it's pretty neat. Just realizing that people will always come and go, and the game is bigger than any player who will ever play it, that is the thing to keep in mind. JS: James, at your end, we had a Twitter question—asking fans ahead of time what they'd ask you pros—and there was one from a tennis-loving fan named @supalovacee who inquired as to whether you are involved with USTA Player Development. James Blake: That's a good question. I'll find out in the near future, I hope. I was talking about life after tennis, and I agree with Raj on how quickly it goes. It seems like not too long ago I was a rookie on tour, and now I see guys I used to play against are more coaches than players. And it happened quickly, but now I'm thinking about what life after the tour will have in store for me. I've taken about a year now of just being a dad, which is probably the best year of my life because I get to spend it with my kids. [Blake has two young daughters now.] I plan on getting back to the real world and the working world, and I have to make a decision if I want to stay with tennis or get out into the business world. One job that would definitely keep me in tennis is that Player Development job because I do feel like there are ways I would be able to help and be impactful as a former player. I'm still at least somewhat recent enough that people would know who I am and hopefully have some respect for what I did on the court, and hopefully listen to the ideas I have from seeing what the USTA Player Development had done well and had done poorly. Hopefully fix the things that have been done poorly and stick with the things that do work. JS: What do you think has been good and bad about Player Development the last few years? Blake: I think that, if I gave all my thoughts, we'd run out your tape. [gestures to iPhone on table] I think one thing that they could do better is really keeping the communities more involved. I came up in a very different environment than Andy Roddick came up in, which was very different than Mardy Fish. And just really encouraging those areas where we succeeded to have an easier time succeeding, as opposed to having one centralized location and one central plan. I just think there's so many different styles of play, so many different individuals in the sport, that we need to recognize that instead of making it sort of homogenized, where you've got one way of playing, one idea, one ideal. I don't think it would have ever worked if you played Jim Courier, Pete Sampras, Andre Agassi, Michael Chang, and Todd Martin, if they all played the same way. Only one's going to be successful because you need to each be your own individual. I think finding a way to trust a lot of coaches across the country because we have a lot of great coaches, and make sure that they're the ones who are getting the support to bring individuals up instead of just one player. JS: Speaking about Mardy, have you heard from him lately, and do you know what his status is? Blake: Yeah, I heard from him very recently. He's playing some unbelievable golf. He's a great golfer, and he's trying his hand at that, playing some Gateway Tour events. He's giving it a go in that right now. But he's a great guy, a really good friend of mine, and he's also being a great dad. He's got one little one, and he's enjoying life at home with his son. Blake, lacing forehands around the court at will as in his pro playing days, won one point on a netcord winner that trickled over against Ram. JS: We see you outfitted in TravisMathew tonight. What's the latest on the brand with that, with you? Blake: TravisMathew's been great to me, and I'll hopefully continue to be associated with them forever. Now I'm a part-owner, and I like being associated with a brand that has, in my opinion, an appeal with the quality. With the golfers they have, they're trying to get more into fitness now with the TMCA line. Myself, Andy Roddick, and Mardy Fish, we're all wearing that. And we all feel pretty strongly about the brand, that it's made with a lot of high quality, and the people around it are great. I was lucky enough throughout my career to be associated with some other good companies that have high-quality people, but now I really feel like part of the team. And the guys are great there, so I feel pretty lucky. JS: Would you ever splinter off—as you've had some pretty good outfitting on or off the court, red carpets and such—and do the male version of EleVen by Venus? Blake: I partnered with Fila years ago to do something, and it's a lot of work. I don't know if I have the design background that Venus does, and I think I'll leave that to the pros and let them handle the design stuff. My input is really just how it wears, the comfort on the court, the playability. They can pick out colors and all that stuff and tell me what looks good. And when I'm on the red carpet, it's my wife who picks those out, not me. So if I look good, I can't take any of the credit. JS: It's a tribute to her. Speaking of tributes, did you have input on that retro-inspired Agassi homage with the pink? JS: I forget, who did you play in that match? Blake: Teymuraz Gabashvili. At that point, I had lost to him the first time I played him, so I was definitely pretty nervous. Luckily I did, and Andre was happy about it, Nike was happy about it, and I still have that outfit in my closet. That's one of the few things I still have. JS: Do you wear it to Halloween? 'Cause Andre is big on Halloween. Blake: [laughs] I haven't worn it for Halloween, but it's a really fond memory of mine, 'cause Andre's such a great champion, and at that time it was right toward the end of his career, and I thought the tour needed to pay him some respects for all that he did for the game, and that was my little part of doing it. Blake: I should've maybe gotten the hairpiece to go with it, as he was rocking it back in the day. JS: And you could've prayed like him that it didn't fall off. Stay tuned for Part 2 of this conversation, in which Alison Riske discusses seizing her first WTA title in October, budding NCAA talent Jennifer Brady talks aspirations at the collegiate and pro levels, and the foursome engages in some not-quite-stinging verbal volleys.